Once upon a time a poor woodcutter lived in a small village. Though he was very poor he was always a an honest and god-fearing person. On a very hot day, he took his axe and went inside the nearby forest in search of wood. 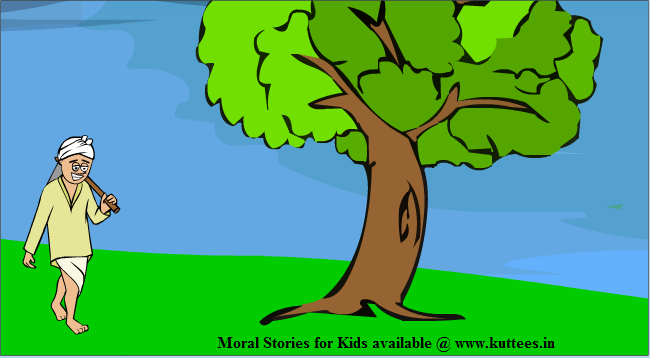 After searching for a long time, he found one good tree near a river inside the forest. As the woodcutter was cutting the woods, his axe slipped from his hands and fell inside the river. The river was very deep. So he couldn't get into the water to take his axe out. He started crying. Suddenly, an angel appeared from inside the river water. She asked why the woodcutter was crying. 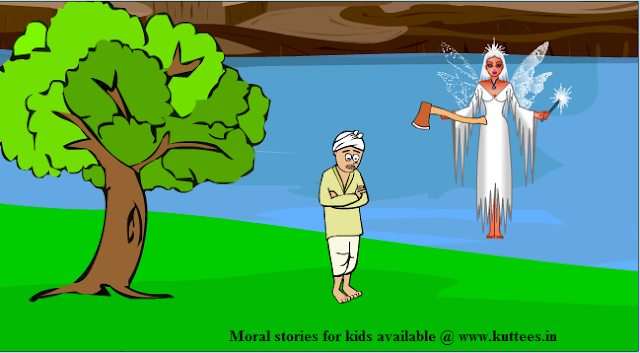 The woodcutter told her about how his axe fell inside the water. The angel went inside the water and after sometime came out with a golden axe in her hands. The woodcutter refused to accept that golden axe. The angel again went inside the water. This time she came out with a silver axe and gave it to the woodcutter. Again the woodcutter refused saying that his was not a silver axe. The angel dived into the water. This time she came out with the woodcutter's iron axe. The woodcutter happily accepted his axe and thanked the angel. The angel was pleased with his honesty. The angel rewarded the gold and the silver axes to that woodcutter. MORAL: Honesy always gets rewarded. A story about two wood cutters serves to delineate the endeavors of today's Internet business visionary, and Internet advertiser. True blue Internet Marketers must keep their abilities and apparatuses sharp to maintain a strategic distance from the "gold rush" mentality of today's Internet, and offer the most ideal support of their clients. The Tale of the Two Woodcutters is a story that aptly depicts the difference between hard work and smart work. Here it is. Such an excellent read! Thanks a lot for reporting. Open http://bigessaywriter.com/blog/honesty-and-integrity-essay-one-story-about-honest-person to read more short yet exclusive stories. I bet that this is an excellent lesson for people of all ages but especially for those little ones who learn about the world. Bianhe was a woodcutter who experienced somewhere in the range of 2,700 years prior. One day, while cutting wood on Mount Jing in the kingdom of Chu, he found a stone he accepted held a profitable bit of jade.I find a very good website for the Best palm sander reviews, If you want you can visit this site.